Create new fonts or modify existing fonts, open any fonts installed on your system (improved in version 3). Open and generate PostScript Type 1 and TrueType fonts. Open and generate PostScript-flavored (CFF/.otf) and TrueType-flavored (.ttf) OpenType fonts (new in version 3). 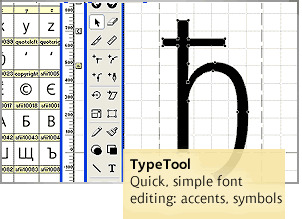 Note: The ability to edit the advanced typographic OpenType Layout features is not included in TypeTool, so other tools such as FontLab Studio, Microsoft VOLT or Adobe FDK for OpenType need to be used. Professional-quality fonts and industry-standard font technology: the engine of TypeTool is based on FontLab Studio, the professional font editor used by numerous font foundries worldwide. Add logos, signatures, ligatures, old-style figures, fractions, currency symbols, punctuation or international characters to your fonts. Make your own text fonts as well as dingbat or clipart fonts. Easy-to-use intuitive user interface with high-quality smooth glyph display (improved in version 3). Open and generate fonts with up to 65,000 glyphs. Edit outline glyphs using more than intuitive 20 tools. Industry-standard Bézier drawing tools familiar to users of Fontographer, Adobe Illustrator or Freehand (improved in version 3). VectorPaint tools for realistic bitmap-like outline editing using shaped brush strokes (improved in version 3). Precise glyph measurement with the Meter mode ruler. True support for open contours and Fontographer-compatible tangent points (new in version 3). Make font variations with automatic glyph and metric transformations such as scaling or slanting. Import bitmap images or BDF bitmap fonts into the new Background layer (new in version 3). Place reference outlines into the Mask layer (new in version 3). Lock any layer to prevent accidental modification of outline or metrics (new in version 3). Metrics and Kerning window for automatic or manual spacing and kerning with multi-line preview, right-to-left support and AFM/PFM metric import/export (improved in version 3). 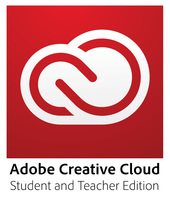 Import and export individual glyphs in EPS format, copy-paste exchange with Adobe Illustrator (improved in version 3). Font Info dialog gives you access to various font properties such as menu and family names, supported codepages or linespacing metrics. Rearrange, rename or re-encode glyphs using two encoding modes with an unlimited number of encoding tables and codepages. Compatible with the entire codepoint range of the Unicode Standard 5.0, including double-byte (BMP) and four-byte non-BMP codepoints beyond U+FFFF (new in version 3). Easy navigation in large multilingual or Asian fonts with the Font Map panel. Excellent screen quality for all generated fonts due to automatic Type 1 and TrueType hinting with Flex Type 1 hint support (improved in version 3). Minimal modifications possible: preserve the original screen hinting and the original OpenType Layout tables as long as glyphs are not modified by the user (improved in version 3). Versatile sample and preview printing of fonts and individual glyphs (improved in version 3). Redesigned preferences; save, open and exchange preference profiles (new in version 3). Uses VFB file format compatible with FontLab Studio, BitFonter 3, ScanFont and TransType (improved in version 3). Opens/Imports: Win Type 1 (.pfb), ASCII/Unix Type 1 (.pfa), TrueType / OpenType TT (.ttf), OpenType PS (.otf), EPS, BMP, TIFF, FontLab 2.5 (.vfa), FontLab 3.x, FontLab 4.x, FontLab Studio 5 (.vfb). Mac version also opens Mac Type 1 (FFIL/LWFN/.suit) and Mac TrueType (FFIL/.dfont). Generates/Exports:Win Type 1 (.pfb), ASCII/Unix Type 1 (.pfa), TrueType / OpenType TT (.ttf), OpenType PS (.otf), EPS, BMP, TIFF, FontLab 3.x, FontLab 4.x, FontLab Studio 5 (.vfb). Mac version also generates Mac Type 1 (FFIL/LWFN/.suit) and Mac TrueType (FFIL/.dfont). Note: Editing of advanced typographic OpenType Layout features is not possible. Tools/operations: Drawing, Erase, Rotate, Skew, Zoom, Insert Node, Remove Overlap, Merge Contours, Intersect Contours, Break/Join Contour, Snap to Guides, Meter, Autohint, Remove hints, Decompose, Knife, Magic wand select, Add corner, Add curve, Add tangent, Brush, Pen, Line, Text, Rectangle, Ellipse, Action (8 filters), Undo (200 levels). Windows: Glyph Window, Font Window, Font Info Dialog, Metrics/Kerning Window, Font Map, context sensitive popup menus and property windows. Encoding: 40 built-in encodings (Adobe, Microsoft, Apple, ISO); 150+ built-in codepages (Adobe, Microsoft, Apple, ISO, IBM, OS/2) including 2-byte Chinese, Japanese and Korean. Printouts: Font Table, Font Sample, Glyph Sample. Hardware requirements: 64MB RAM, SVGA Monitor, Mouse. For Windows version: Microsoft Windows (98/ME/NT/2000/XP/Vista). For Mac version: Mac OS X 10.3 or higher (Power PC version only; runs on Intel using Rosetta — see details). Keyserver compatible.